As many as 100,000 people die each year from medical malpractice mistakes made by doctors and nurses in a hospital setting. Most of these medical malpractice mistakes are not reported. For obvious reasons, these mistakes are rarely identified and are often hidden to patients and patient family members. Doctors, nurses, physician assistants, nurse practitioners, pharmacists, and hospital administrators can all make medical mistakes that directly affect patients. Common examples of hospital mistakes include nurses and doctors who administer a drug incorrectly, administer the wrong drug, failing to diagnose or notify a patient of an obvious condition, and failing to treat a particular condition. Other examples are failing to monitor a patient, failing to secure a patient in the bed resulting in a fall, and failing to rotate a patient resulting in severe bedsores. You should know that even if the medical mistake was made by a single health care provider, the hospital may bear liability for the wrongdoing of its employees. This is why it is essential to hire a medical malpractice attorney with a medical background who understands how the medical system works. The Medical Malpractice Law Firm has successfully litigated many medical malpractice cases involving hospital mistakes. 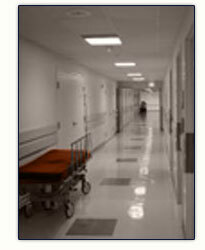 If you need a medical malpractice lawyer in Dallas call an attorney at The Medical Malpractice Law Firm.